If you are curious about HDR photography, the Photofocus blog has a cool HDR Learning Center. Photofocus is a great resource for all things photography. They post every day and have a helpful podcast that broadcasts about three times a month. 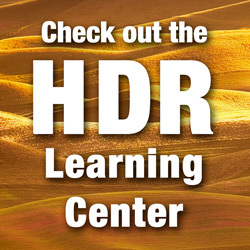 On their HDR Learning Center, you can find an HDR primer, a free download of HDR software Photomatix, and a long list of HDR posts. While you are in the mood, check out our Free Photo Webinar with Angela Pan.